” In setting up our own Ombudsman office, we first need to ask ourselves, what kind of society do we want Bougainville to become? How important is it to us to have a body that holds our elected leaders to account and encourages open, transparent government? How much can we do with what we have? Those are the sorts of questions we need to be asking. We have many hard decisions to make and challenges to face, which is a normal process of growing up. Autonomy means building our state institutions in governance and in other sectors. 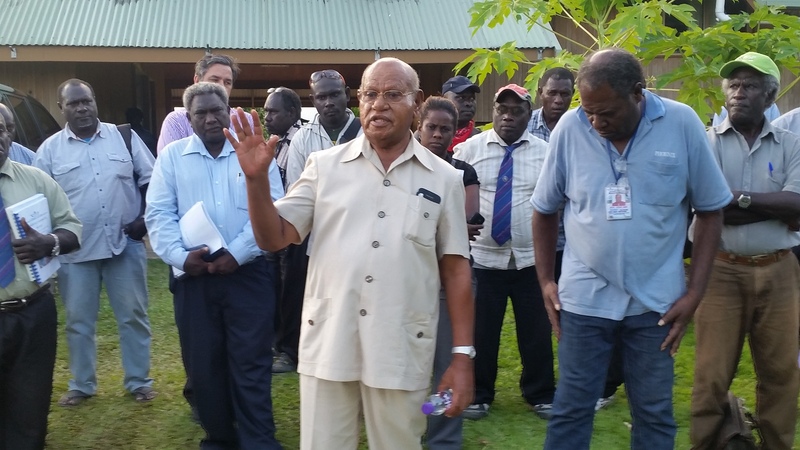 Bougainville should begin the groundwork soon to have its own Ombudsman by 2020-22. 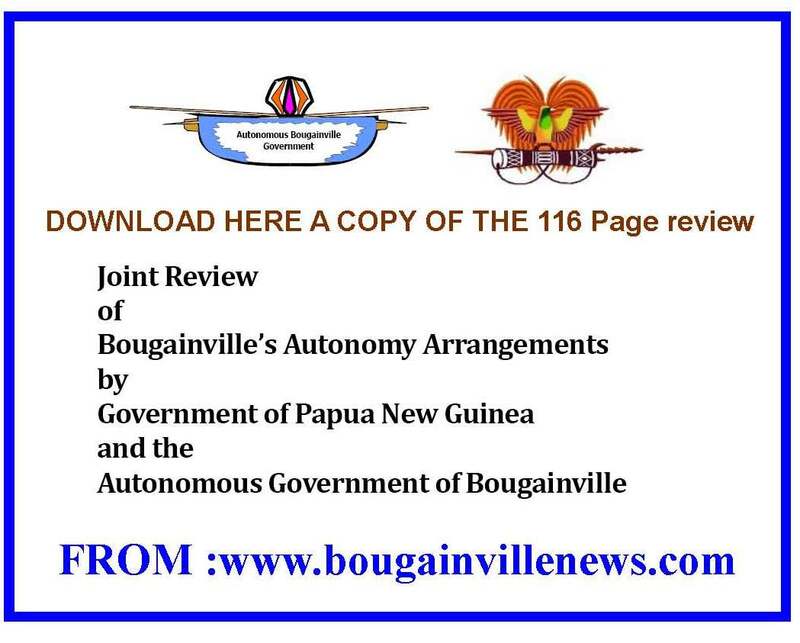 The Autonomous Bougainville Constitution provides for a Bougainville Ombudsman. I reckon by the year 2025 it should be sufficiently well established to be inducted a member of the International Ombudsman Institute. 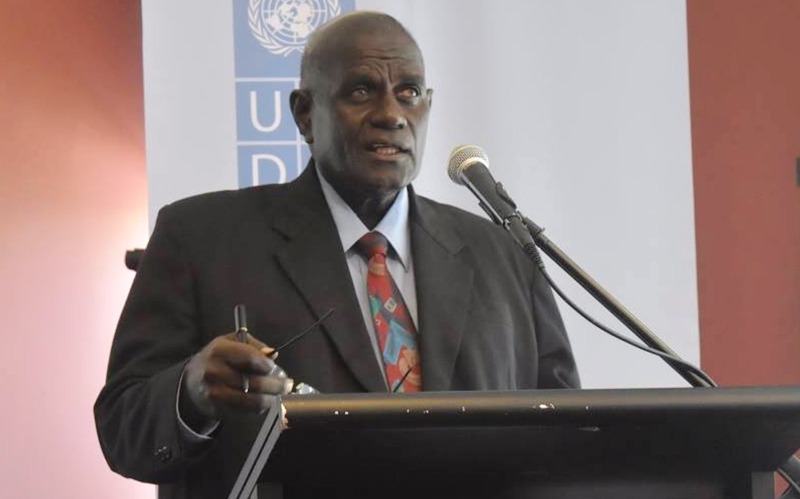 The kind of Ombudsman Bougainville needs is an oversight body – to oversee the activities of government and give the people confidence that their representatives are following the rules and governing transparently. 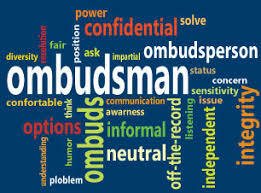 The Ombudsman’s purpose must be clearly understood and appreciated by everyone – that is, by the governors who are elected to lead and by the governed, who have an expectation that those that they elect to govern can be trusted to lead. My six years as PNG’s Chief Ombudsman have given me many insights into what works and what doesn’t work when it comes to oversight bodies and how time and resources can be wasted if the right efforts are not being made to bring to bear the changes and results needed. Without sounding idealistic and simplistic, if Bougainville borrows the best practices and processes from the PNG Ombudsman Commission and discards those that have rendered its processes tardy, futile and adversarial, as well as looks at the strengths of the traditional role of the Ombudsman around the world, Bougainville’s Ombudsman could be a vital, effective cog in our democratic machinery. 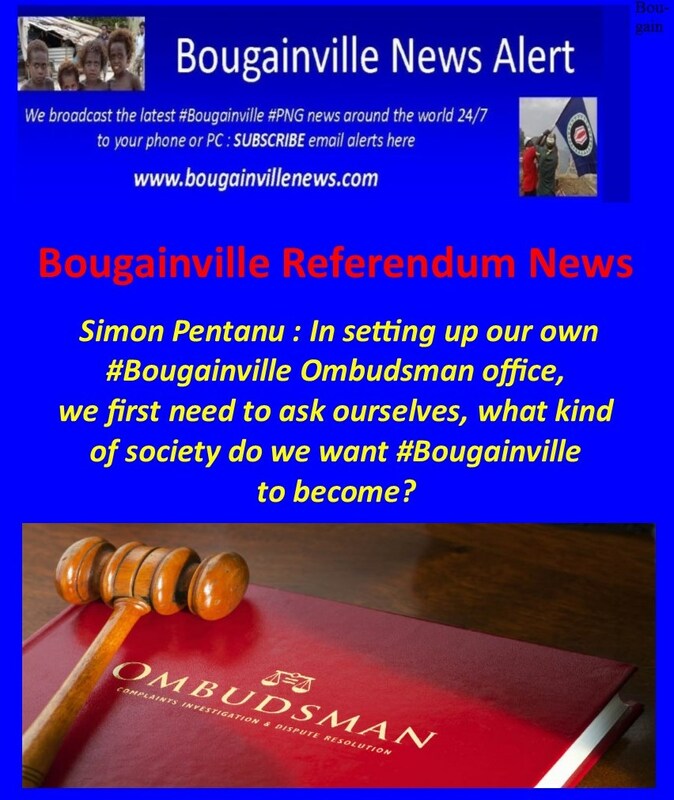 In setting up our own Ombudsman office, we first need to ask ourselves, what kind of society do we want Bougainville to become? A Bougainville Ombudsman that is fully functional and has the support and respect of elected leaders and the people can set the tone for the whole society – government, business and the community. To this end a nurturing role in a highly involved mentoring and consultative process would be fitting. Bougainville is a relatively small Island in terms of land size and population but has the resourcefulness and a wealth of experiences to learn from its past and steer clear of bumps and potholes into the future. If we are serious about Bougainville’s future wherever we are, we should all think, metaphorically speaking, like an Ombudsman. The institution of Ombudsman that functions well and which a society can relate to in terms of delivering on the expectations of good, honest government can be tremendous help and value to society. And the old adage is worth keeping in mind: if a job is worth doing at all, it’s worth doing well. A Bougainville Ombudsman that will nurture and develop our leaders to appreciate their roles as elected representatives and their value to society, cannot depend solely on the advice and assistance of the over-stretched Ombudsman Commission of PNG. We need to look to the best international models and learn from the premier international examples. We are fortunate to have the recently established PNG Ombudsman Commission Regional Office in Buka. That office can be used to start the groundwork for establishing a Bougainville Ombudsman, but that should not be the only source of our advice and assistance. Let us not stall on establishing, or seriously thinking about, important state institutions under the Autonomous arrangements on the basis of lack of funds. Whenever we hold out inadequate finances as the main explanation we will keep believing this to be obstacle. A better way to think about it is that we have challenges in how we allocate and spend our available financial resources. We have to prioritise. How important is it to us to have a body that holds our elected leaders to account and encourages open, transparent government? How much can we do with what we have? Those are the sorts of questions we need to be asking. We have many hard decisions to make and challenges to face, which is a normal process of growing up. Autonomy means building our state institutions in governance and in other sectors. A serious discussion about a Bougainville Ombudsman immediately at back the end of Referendum process would be timely and important. Having said all of the above I would also seriously caution the ABG and the House of Representatives not to rush into invoking the constitutional provision to create a Bougainville Ombudsman Commission overnight or before the referendum if the intention or motive is to avoid any elected leader in Bougainville from being referred to the Ombudsman Commission of PNG for alleged misconduct in office under the leadership Code. ” All four national Members: Hon Joseph Lera, Minister for Bougainville Affairs, Jimmy Miringtoro, Minister for Communications, Hon Louta Atoi, member for North Bougainville and the recently elected MP for South Bougainville Hon Timothy Masiu all took turns to air and share their views on the importance of consultations and commitment to work together on matters concerning Bougainville. 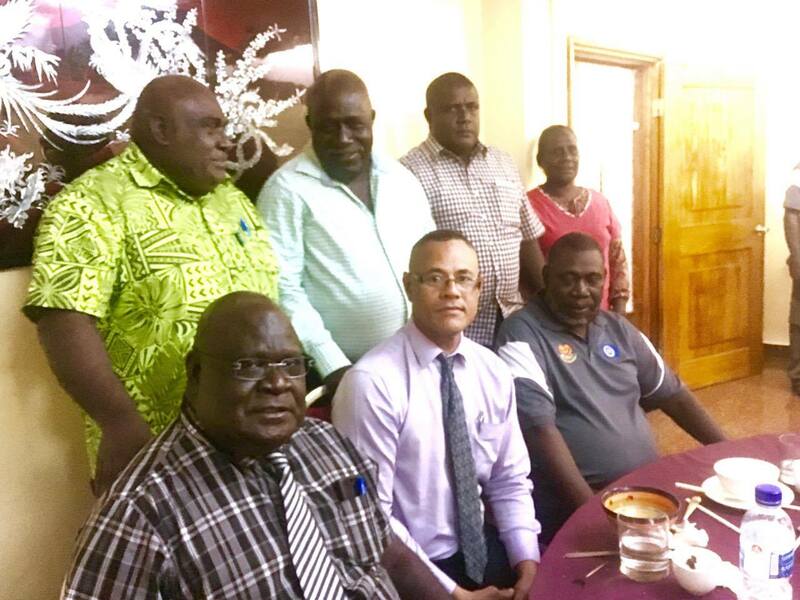 Autonomous Region of Bougainville’s four elected members in the National Parliament have come together, have spoken with one voice and have pledged they will work closely with the Bougainville’s Members of the House of Representatives. In a small, unassuming but important, meeting over dinner hosted by the Minister for Bougainville Affairs on Thursday evening 11 August the four Bougainvillean national MPs made an unequivocal pledge that they will work with Bougainville parliamentarians in consulting, advising, sharing, working with each other and taking part in all matters of political, social and developmental interest and concern to Bougainville. The main guests at the evening dinner gathering were members of the Bougainville House of Representatives committee on Referendum led by its Chairman Hon Joseph Watawi MHR. Photo above :At PNG Parliament Minister Joe Lera MP and Chairman Joseph Watawi MHR both with other colleague members. 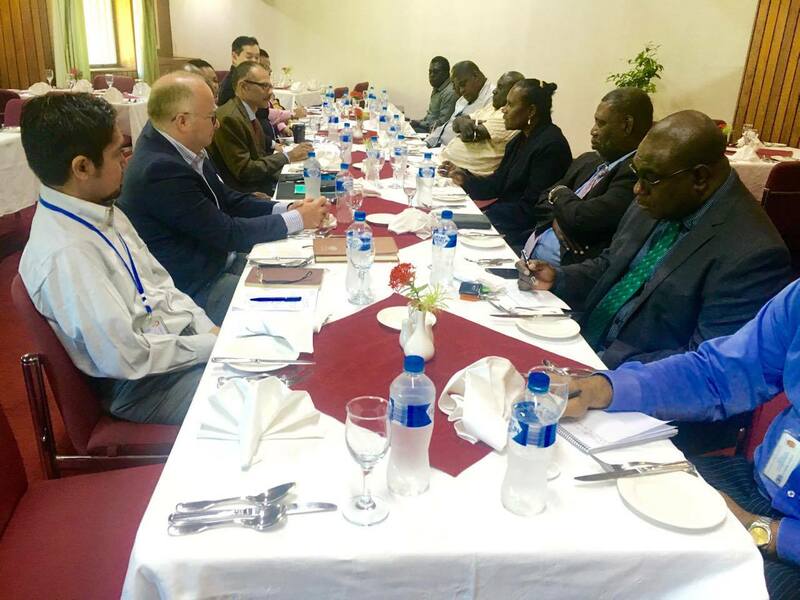 The committee was in Port Moresby to observe the National Parliament in session and meet with the National Parliament bipartisan committee on Bougainville matters including referendum. The joy and exchanges of pleasantries was most obvious. At long last! It is done! There is more than one reason to expect there will be a lot of trust and cooperation from hereon between and amongst Bougainville politicians at the National level and in the Autonomous Region. All four national Members: Hon Joseph Lera, Minister for Bougainville Affairs, Jimmy Miringtoro, Minister for Communications, Hon Louta Atoi, member for North Bougainville and the recently elected MP for South Bougainville Hon Timothy Masiu all took turns to air and share their views on the importance of consultations and commitment to work together on matters concerning Bougainville. A timely and proper, in-depth, educated and adequately funded awareness on referendum was discussed as one of the most important matters needing immediate focus and attention for concerted, cooperative approach by leaders. The people of Bougainville as electors will find comfort, confidence and assurance and can only benefit from the undertaking by their political leaders. Bougainvilleans have often criticized their politicians for not working together on matters that can make a difference with better political cooperation and coordination at the elected leadership level. 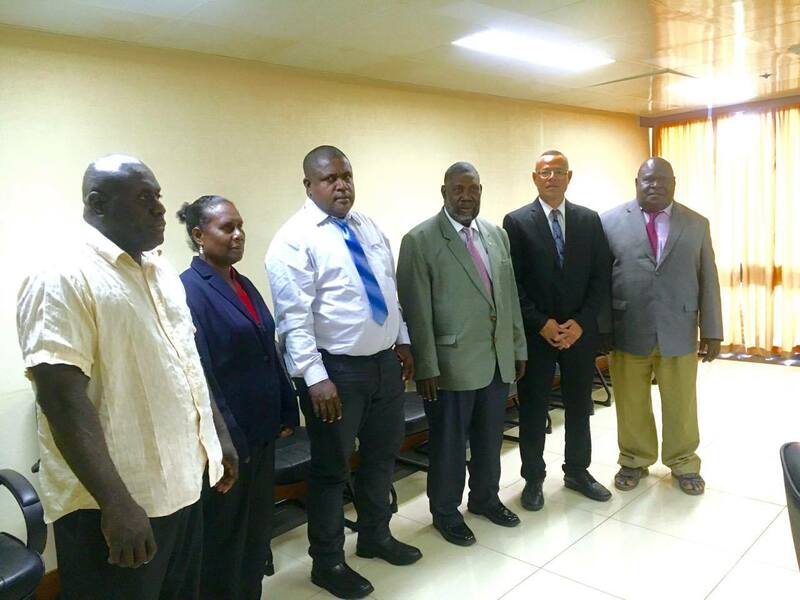 The four MPs representing Bougainville in the National Parliament have pledged that they will, from hereon, work with members of the Bougainville House of Representatives in the interest of all facets of development of Bougainville. The pledge expresses a desire for everyone to be on the same page in implementing the terms and intentions of the Bougainville Peace Agreement, a historical joint creation borne out of the efforts of the National Government and Bougainville’s political and factional leaders. 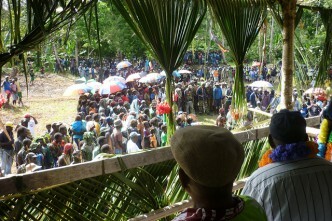 After a number of attempts over many elections on both sides, many exchanges and suggestions, to-ing and fro-ing, and at times laying blame from both sides, this is an achievement by Bougainville parliamentarians in both Houses to come to terms and put aside any differences in their commitment and approach on the ongoing political processes that requires their attention and decision. 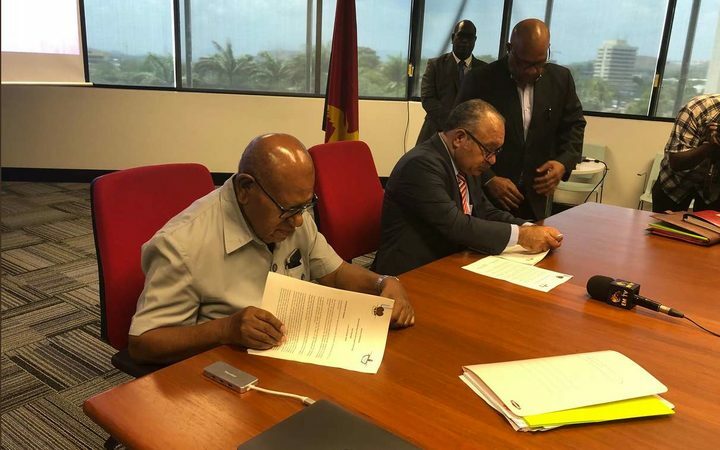 The agreement pledged by the leaders followed two consultative meetings with the Minister for Bougainville Affairs and Chairman Watawi and members of his committee at Parliament House. The Minister Hon Joe Lera said the National Coordination Office for Bougainville Affairs (NCOBA) which he heads as Minister has made a lot of effort to give practical effect to the roles and functions and fulfill the objective why this Office was established in the first place. With his intervention and better focus by the staff, NCOBA will be the primary coordination link between Bougainville and Port Moresby. His first task has been to get his colleagues the Bougainville national MPs to work in closer consultation with him through NCOBA. The Speaker Simon Pentanu who accompanied the referendum committee delegation in his remarks praised and thanked the national MPs for this development calling it remarkable because he said it will see, in a long time, a meaningful consultative effort and cooperation by Bougainville parliamentarians at the national level and on Bougainville. He said he will be inviting the four national MPs and expect them to take their seats in the House of Representatives in the forthcoming meeting in September and at all subsequent meetings of the House. He also said that from now on the dates of meetings of the Bougainville Parliament will be determined so they do not clash with National Parliament meetings to enable the four National MPs to attend. Photo Above : Meeting with PNG Parliamentary committee on Bougainville Matters and referendum, with UNDP and agencies invited as observers. Hon Ministers Joseph Lera also informed the dinner meeting NCOBA is improving its coordinating role and under his watch he expects to deliver on the aims and objectives for which this Ministry for Bougainville was established. His colleague national MPs praised and agreed with Minister Lera that since he assumed office as the Minister there has been enthusiasm, zest and zeal about the place. The Speaker of the House of Representatives Simon Pentanu MHR has announced the 2015 Budget meeting will commence on Monday 21 December at 2 o’clock pm. This is the date agreed to in consultation with the President and the Minister for Finance taking into account the preparation time for the budget to be finalised. The House will meet over two to three days to consider and approve the Autonomous Region’s budget for 2016. This will be the final meeting for this year. The first meeting of the House in the New Year will be in March at a date and time to be fixed by the Speaker in consultations with the President. In a prepared statement the Speaker also made brief reference to a number matters on his impressions to the start of the Third House 2015-2020. The Speaker said the start to his term in Office has been eventful. It has been a period of settling in for all members, including Ministers. The Speaker expressed a particular delight that the House has appointed its main and important select and statutory parliamentary committees early in the life of the Third House. 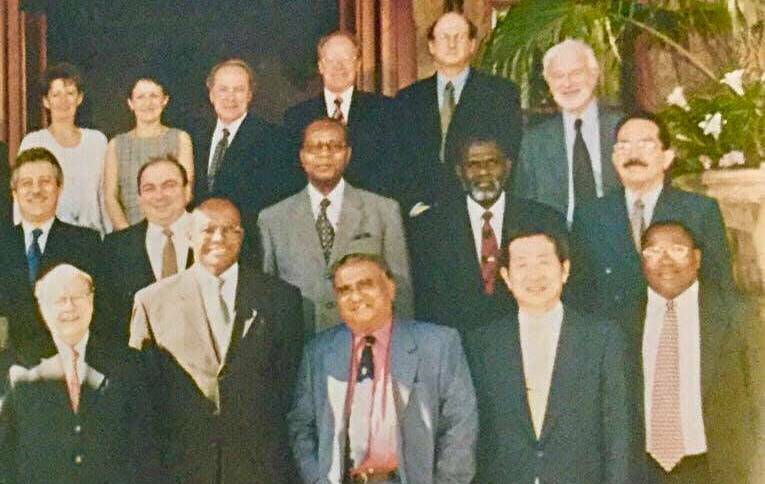 The parliamentary committee system in its full operational capacity would provide the best opportunities for members to play their rightful roles in wider and inclusive ways as leaders, lawmakers and elected representatives. Mr Pentanu said resources, financial resources in particular, will continue to be a challenge in the administration of the Parliament. In this regard the Speaker said that sadly, over the last ten years the Parliament which is an important arm of the Government has been poorly resourced. Even more appalling, the Legislature as one of the three symbiotic arms of the Government has been regarded , if not degraded as if it is just another administrative arm of the Autonomous Bougainville Administration. He said that unless this attitude is changed Parliament and its parliamentarians will not play their representative, lawful roles as long as the Parliamentary Service continues to be poorly resourced. He said it is already obvious to him that the demand on members’ time and effort compared to the meagre resources that come with the office of a member is enormous. A Parliament and parliamentary service that is adequately resourced can plan well in supporting the constitutional mandate of elected leaders and provide integrity and respect to the roles they are expected to perform. Our whole financial administration regime and accountabilities for funds at every level need to be blow torched and overhauled. We cannot continue to walk up and down the same corridors and expect different results. I am confident however, we have the leaders in Parliament to institute changes through well thought out and considered decisions to demand more and better accountabilities overall over ABG’s finances in order to do and achieve more from the resources Bougainville is raises and receives. Our members are not just law makers, the Parliament is also the highest oversight body to which the Executive and the bureaucracy is accountable. Our women parliamentarians have shown confidence, commitment, desire and a strong will to make their marks inside and outside Parliament as they strive to represent women of Bougainville. Their participation in debates, the questions they direct at the ministerial benches and their appreciation of what their roles entail has been impressive so far. Our three members representing the former combatants have contributed to discussions and debates in an assured way. They are members of important parliamentary select committees. However, as representatives of interest groups the members need more assistance in articulating the hovering constituency issues in a way that Parliament and Bougainville leadership may be able to involve or utilise their membership in a progressive way in connection with the constituents they represent. The management of the business of the House, the corporation and collaboration with the Executive in Parliament and attendance and participation by all members during parliamentary sessions has been pleasing. Members have benefitted from inductions at the start of their political and parliamentary career. Member’s attendance and participation at a recent parliamentary seminar jointly hosted by the Department of Referendum, Peace and Veterans in a rural setting was very encouraging. Ours is a Parliament by the People, for the People, of the People and we must go back to the People at every opportunity. I do not see why this should be difficult when this is the duty and desire of all members. It is absolutely possible with proper planning and adequate funding under an arrangement in which Parliament is funded separately in an autonomous arrangement where it is provided and is accountable for its funding. In my earlier post I argued that, notwithstanding the strong legal underpinning of the 2001 Bougainville Peace Agreement, it’s possible that Bougainville and Waigani may be on a collision course. What would such a collision mean for Australia? In the event that a referendum were held and clearly favoured independence with the outcome subsequently ratified by the PNG Parliament—accompanied by an orderly transition—Australia would have little choice but to accept the result. But while this is a possible outcome, it’s by no means the most likely scenario. Far more likely is a situation in which Papua New Guinea and Bougainville find themselves at odds. 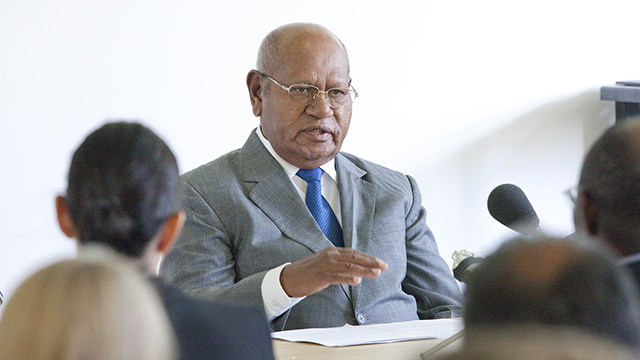 Differences could arise in a number of ways but at the more serious end of the range, possibilities include either a refusal by the PNG Parliament to recognise a pro-independence referendum outcome, or a failure by Papua New Guinea to agree to a referendum going ahead at all. To this, it might be countered that Article XIV of the PNG Constitution includes a range of dispute resolution provisions including through the courts. Yet this ignores the fact that any differences that may arise are far more likely to be political differences than matters of interpretation that are amenable to mediation or judicial resolution. In either of the disputed situations outlined above Australia would be faced with difficult choices. Of course, Bougainville isn’t Australia’s responsibility, but Australia has a stake in Bougainville’s future, including its relationship with Papua New Guinea. Australia doesn’t have the luxury of not having a view on these questions. In any serious dispute, both sides would look to Australia for support. Whatever the legal niceties, the PNG government would expect to have the greater claim on Australian support, both on historical grounds and in the light of more recent experience—you-scratch-my-back-and-I’ll-scratch-yours (i.e. Manus) grounds. For their part Bougainvillean groups would point to Australia’s role in acting as midwife to the BPA back in 2000. 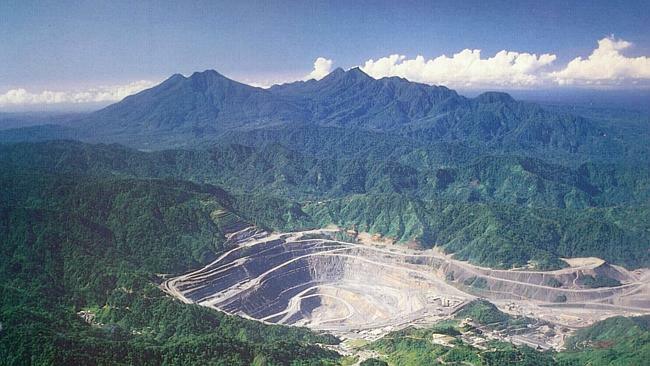 In any such scenario a range of Australian interests would be thrown into the balance: Australia’s stake in Papua New Guinea’s long-term security and stability; the state of the bilateral relationship; the risks of renewed violence on Bougainville; the implications of any action (or inaction) on Australia’s part for its broader role in the region. Many decisions are yet to be taken by the parties themselves, and many variables remain in play. While there are the beginnings of discussion in Bougainville on possible transition scenarios, there’s no requirement for a referendum to be held before 2020, so any breakdown in the process—assuming one does occur—might be years away. So it’s wise not to take the scenario-building too far. For Australia, however, the key point is this: Downer’s 2000 formula (Australia would ‘accept any settlement negotiated by the parties’) has served successive governments well over the past 15 years when all parties could sincerely declare themselves committed to the BPA. It’s a good formula, and if anything it’s been reinforced by the regular commitment to honouring the BPA included in Ministerial Forum communiques. That said, enough risks are now apparent to suggest that this formula may be reaching its use-by date. Events beyond Australia’s control may require Australia to declare its hand one way or the other. None of this will be news to Australian officials engaged in PNG policy and, given her personal interest, it’s safe to assume that Julie Bishop understands what’s at stake. That doesn’t make the choices that may be faced any easier. 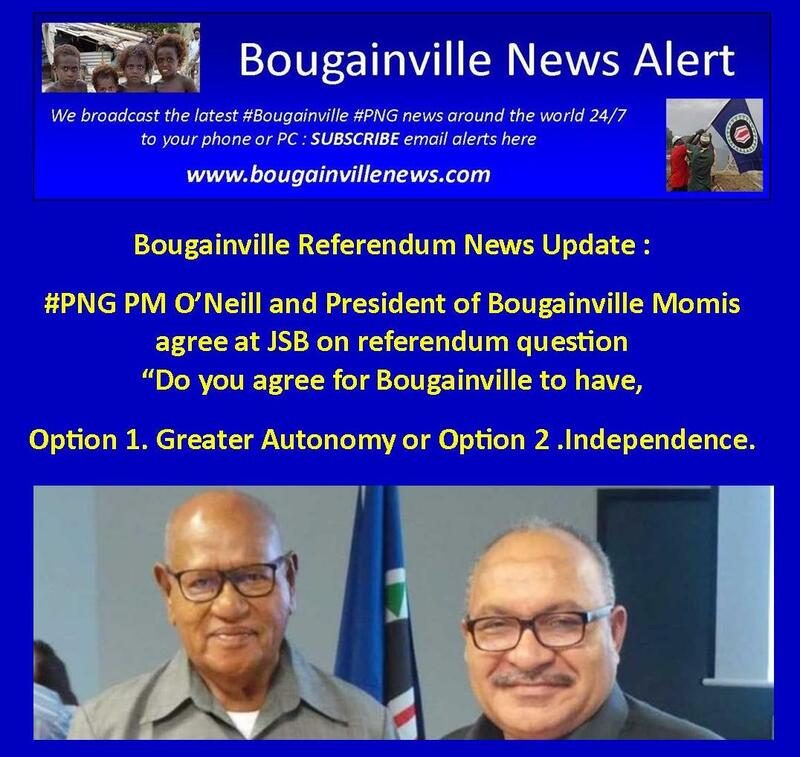 Much of the above analysis renders the Bougainville issue down to a binary choice: independence or not. Might there be another way of framing the issue? It’s possible that the parties themselves could think of a ‘third way’, even if no such options have been canvassed publicly so far. 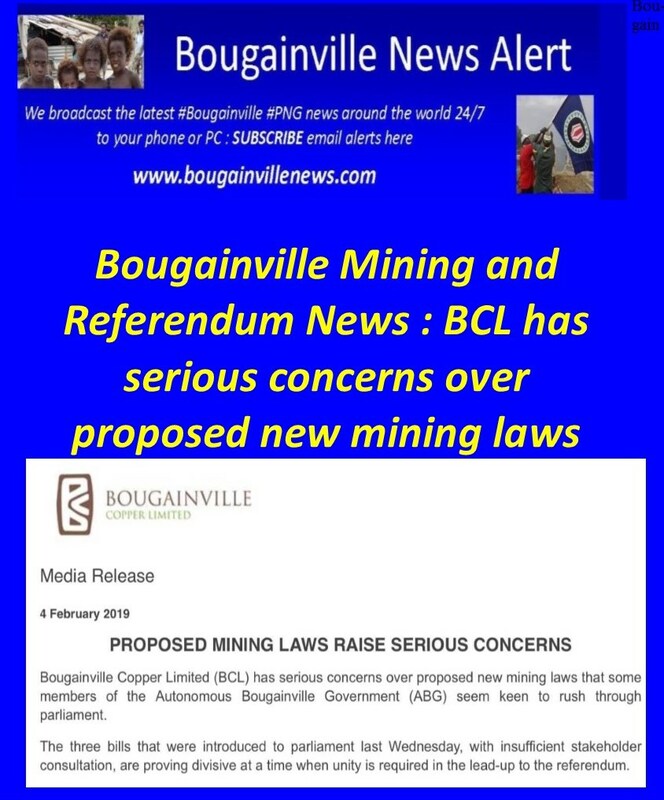 Even if the PNG and Bougainville governments find themselves seriously at odds on the referendum issue over the course of the next five years, it shouldn’t be assumed that they wouldn’t be able to come up with creative solutions. A worst case scenario isn’t inevitable or even the most likely outcome. This is where Australian diplomacy could play a role. In 2000, Alexander Downer moved the peace process forward by helping the parties see beyond the immediate binary choices they felt confronted with at the time. The BPA may not have solved the Bougainville question definitively, but it has given the people of Bougainville fifteen years of peace. It may yet turn out that the key contribution that Australian diplomacy can make is to help the parties see the future as something other than an exclusive yes/no choice. James Batley worked in the Department of Foreign Affairs and Trade, and in AusAID, between 1984 and 2014 including postings in Papua New Guinea, Solomon Islands, Vanuatu and Fiji. He currently works as a Distinguished Policy Fellow in the State, Society and Governance in Melanesia program in the Coral Bell School of Asia Pacific Affairs at ANU.